‘The Bohemians’, established in 1909, are one of Edinburgh’s major amateur musical companies. Sister Act was one of the first DVDs I was ever given as a child. There was always a magic to the film that I adored and Whoopi Goldberg never failed to have me dancing and singing along with the other nuns. Cheri and Bill Steinkellner adapted the Whoopi Goldberg classic for stage; something I am so glad they did. Bohemians’ director Colin Cairncross took on the challenge, bringing to the stage a production full of vivacity and talent. For an amateur production, this show really did impress. Ian Monteith-Mathie took on the role of Musical Director for this production and worked with Alan Menken’s music score to create a beautiful sound from the performers – the harmonies in the full cast numbers were incredible. His orchestra carried the cast through the show in funky rhythms and soulful melodies. Niloo-Far Khan took a walk in Whoopi’s shiny heeled boots as Deloris Van Cartier and commanded stage with ease. Vocally, her performance was faultless and she gave great gusto to her character. 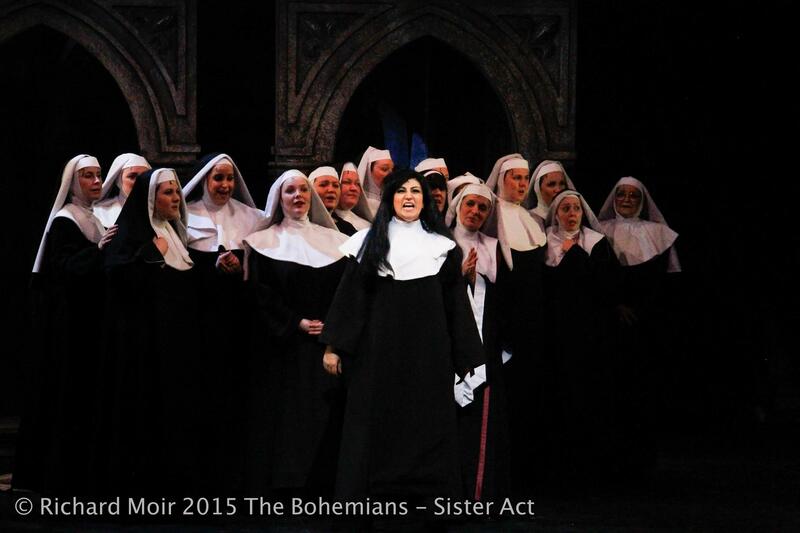 Her on-stage rapport with Mother Superior – portrayed by Dorothy Johnstone – was as entertaining as it was electric. The pair shone in the spotlight as they battled to prove the other wrong before finally reconciling their differences. Johnstone carried a wisdom about her that was evident in both action and song and her protective instincts towards the nuns shone through. It was truly delightful to witness the transformation of the choir of nuns – the resulting musicality from the hard work of Deloris (and Monteith-Mathie) raised hairs on the neck. It was, for lack of a better word, divine. Officer Eddie Souther lamented that he “Could Be That Guy” and if he was referring to a talented singer and a joy to watch on stage, then Gareth Brown certainly was “that guy”. His soft, awkward character was greatly set against the imposing Curtis Jackson. Padraig Hamrogue’s portrayal of Curtis was reminiscent of the black and white gangster movies – his menacing demeanour coupled with a bluesy bass range created an imposing mobster who demanded respect through fear. His three henchmen, Joey, TJ and Pablo juxtaposed his dark humour by lighting the stage with their comical desperation to please their boss. 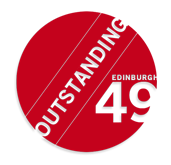 Thomas MacFarlane, Lewis McKenzie and Andrew Knox really threw themselves into their characters and greatly entertained the audience with their antics – their song, “Lady in the Long Black Dress”, was hysterical, offering the comic trio a real chance to hustle the limelight. The show was bathed in colour. The costumes – a superb effort from Jean Wood and Liz Kenyon – were fantastic; Lighting Designer Jonnie Clough filled the stage with a complex programme of spotlights, colourwashes and dazzling effects. The set design from UK Productions Ltd, although perhaps too large and busy for the stage space, was certainly impressive in its detail. This production was full of glitz and glamour; even the nuns were able to lose the basic black habit for something a little (or a lot) more colourful. The cast raised their voices and they raised the roof. This was an uplifting performance and a fantastic show. Visit the King’s Theatre archive.